Documentation and SupportReleases 2015-11-17 ReleasesYou can now generate a template for pasting into forms. Template is a new feature to the forms. If you use excel or a similar spreadsheeting application, you can click Template. 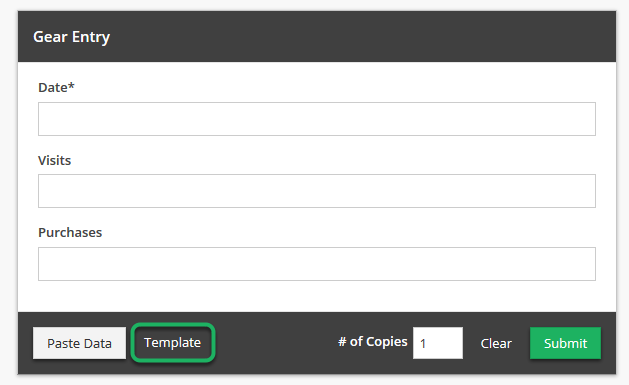 This downloads the form template in a csv format. You can then fill in the data into the appropriate columns. Then copy/paste out of your application into the Paste Data field. 1. Clicking on the Template button will download a template for the form. Prev: You can now quickly edit a dashboard within the dashboard view. Next: Shared dashboards can now be set as your Home Dashboard or default.